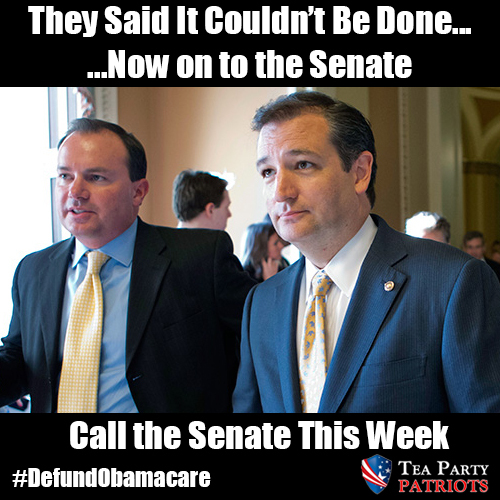 House defunds Obamacare. Now it’s the Senate. Call these senators!!! Last Friday, the House voted to fund the entire government as well as to stop the funding for Obamacare and it is all because of you! Critics said this couldn’t be done and you did it! Now the fight moves to the Senate and we need all hands on deck. This could be our final chance! Starting tomorrow morning, Monday September 23, we need you to call your senators demanding a 60-vote threshold for any effort that would add Obamacare funding back into the House Continuing Resolution which funds the entire government and does not spend our tax money on Obamacare.The plan to defund Obamacare is our best and may be our last hope at stopping this “train wreck” law. Remember our Congressmen and Senators and their staff are exempt from this law yet those who vote to fund it want us to pay for it and live under it. We still have time to stop it. Sen. Reid will use every procedural gimmick and trick to add funding for Obamacare back to this CR. We need you to call your Senators’ offices in DC and locally demanding a 60-vote threshold for any effort that would add Obamacare funding back into the House bill. If you can possibly go to the local office of your Senators early this week, do so and demand the 60 vote threshold for any effort that will add Obamacare funding back to the House CR. For more information visit out website. We will be sending as many updates as we can this week, so be on the look out. Remember: Your hard work over the last few weeks moved the House of Representatives to support the effort to defund Obamacare!! Here is a list of all Senators. The ones who need special attention are highlighted. This entry was posted in Congress, Economy, Health Care, Liberals/Democrats/Left, Obama, Republican Party, Taxes. Bookmark the permalink. tell them vote to end it or resign! Thank you Dr. Eowyn for this extremely important post. Good for the House!!! I just called each of my senators’ offices. Everyone, please get busy and contact your senators at once! I called mine (WA ST), and got a standard non-committal response. They will vote party line anyway. Hopefully some others will listen to the people. People in Mississippi resent the fact that Lee and Cruz have contributed to the division in the Republican Party. They both lent their names to chicken ads demeaning both Republicans senators in our state and this has angered many people. Now they want their support. This is not exactly the way to get it. People in my area are not impressed with these inexperienced rookies. America to Become the Next Poland?